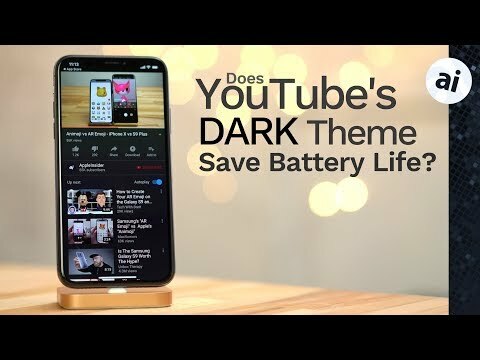 Does YouTube's new dark theme save iPhone X battery life? The YouTube app for iOS just received an update, bringing with it a new dark theme that could translate to an increase in battery life for iPhone X. We put the app to the test to find out. With traditional LCD technology, applicable to all Apple device screens save for iPhone X and Apple Watch, light emitted from a backlight travels through color-changing pixels to create an image. That means the backlight is always illuminated even if sections of the screen are black. Unlike LCDs, the pixels in OLED panels output their own light, meaning darker pixels require less power to drive than bright or white pixels. This is why dark user interfaces on OLED devices save on battery life. To enable YouTube's dark theme, make sure you're updated to the latest version, then tap the account icon, go to settings, and toggle the option to the on position. For our tests, we turned off auto brightness on our iPhone X, set auto-lock to "never," and turned up screen brightness to around 80 percent. After leaving the YouTube app -- with its regular bright UI -- open on the homepage for three hours, battery life dropped from 100 percent to 71 percent. We charged iPhone X back up and did the same thing with the dark theme enabled. This time, the battery only went down to 88 percent after three hours, a considerable difference. We then played a three hour video and left the iPhone X standing upright to keep the app's UI in view. With the white UI, the battery dipped to 55 percent, while the dark UI finished the same task with 76 percent left in the tank. YouTube's dark theme is confirmed to save substantial power. We can only imagine how much better the feature would perform if the mode presented the UI as black instead of dark grey. Perhaps most importantly, the mode does not detract from the app's experience. In fact, we think it has a much cleaner look and is actually easier on the eyes than the traditional bright white. Try it out for yourself and let us know if you notice a difference on your iPhone X. Dark Mode. They were originally going to call this mode, “Color of Google’s Soul”. Great! Maybe one day the AppleInsider app will also have dark mode when reading articles. I want a dark mode so I can use my phone AND my computer at night. The bright screens absolutely interfere with my sleep. But I need to work. Dark mode to read; white mode to print. As simple as that. Dark mode. Awesomely good. Even better on the big screen. Just use the AppleInsider app with Smart Invert . i keep it with a triple home button click. while there is nothing wrong with the video, it's pretty much useless. nobody spends any significant time being in the youtube menu and we all know oled can turn off the pixels. A true to live test would've been more useful. If only Apple would do this OS-wide. Would Appleinsider introduce Dark Mode too? I hope Apple has a way for developper to tell if their App have a dark mode. Otherwise, if an app is in dark mode, and we activate Smart Invert, we don't get what we want. I've been using YouTube dark mode since it was enabled on my X. Can't say whether it reduces battery use, but it is easier to look at, especially at night. As others have noted, I do shift to Smart Invert if I'm reading on my X in the middle of the night, as I often do. In part it's easier on my eyes and doesn't wake my wife from the otherwise bright yellowish light. Can someone tell me how to set auto-lock to "never," with Face ID on? I just upgraded to 11.3 and Smart Invert is much better because images are no longer inverted. However embedded YouTube videos are as well as images linked in embedded tweets (not liking the embedded tweet trend but the people have tweeted). Also, we need Smart invert with truetone and night mode. Still, websites would be wise to detect smart invert if possible and optimize accordingly. For instance, Smart Inverting this page yields bright white backgrounds around our usernames in the comments section as well as the header of the page, which generate enough brightness to perhaps defeat the purpose. I’ll check further this evening. Goole and 'dark mode' ... sheesh, I am not even going there. Meanwhile, Apple, please add dark screen option to Photos just as iPhoto and Aperture had and I'd be thrilled. Photos burns my eyeballs. The benefit of OLED. Dark is truly dark. Pixels are turned off. I hope that Apple applies this to the iOS. If I recall correctly, the 2018 LG OLED TVs have a dark mode selection on the UI which will definitely save energy. Agree - There are many times when having a dark background with light text is preferable, although until the introduction of the iPhone X there really wasn't any battery advantage to it. perhaps now that Apple is venturing into OLED displays they'll take a look at it.